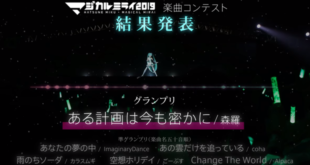 Home / News / Events / Magical Mirai 2019 Song Contest Announced! 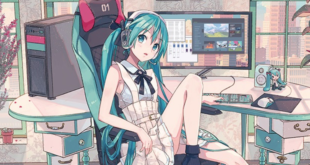 Starting today, the Magical Mirai 2019 song contest has begun! Want to join and submit an entry? Keep reading below for in-depth details and rules of the contest. Their song will be featured live on stage at Magical Mirai. A pair of tickets for 1 live performance where the song will be played. (Travel expenses not included.) OR If they prefer, an assortment of Magical Mirai 2019 goods instead of the tickets. A gift card for SONICWIRE, with the value of 100,000 JPY (approx. 913 USD). You can only use 1 character per song. For example, you are not allowed to use other Vocaloids in the chorus etc. The song can have a maximum length of 4 minutes and 30 seconds. The file format must be MP3. The song must be submitted without any license conditions set. Submissions are limited to original songs which have not been announced publicly yet or submitted to other contests. You cannot submit your entry through a publisher or other business of a company. If your entry is a collaboration, you must choose one person as a representative and contact. Until the results are announced, please do not submit entries to any sites other than Piapro. Please note that the contents of the project and application conditions can be changed or cancelled at any time without prior notice to applicants. In case of infringement claims or complaints from a third party against an entry, it is up to the entrant to solve the situation. Piapro will not take responsibility about it. Regarding the winning entry, the rights of use shall be transferred to Piapro for live performance, commercialization etc. but royalty payments shall be made by Piapro to the entrant. 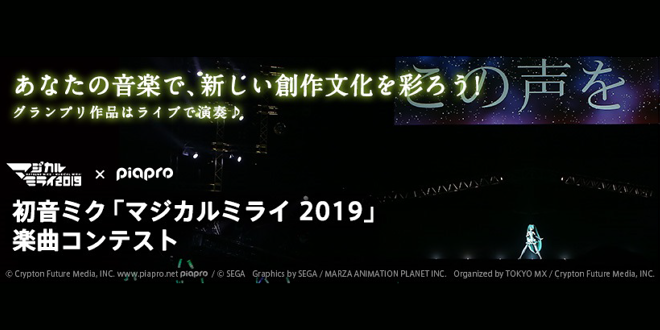 The Magical Mirai 2019 song contest is open from February 1st, 2019 until 17:00 JST on March 15th of the same year. 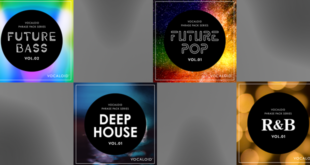 Winners will be selected by the organizers and contacted via the email address registered to their Piapro account and the results will be announced publicly in May 2019. If you would like to enter the contest, you can apply via the Piapro website using this link. *Please note that you will need an account on Piapro to enter. Please pay special attention to the tag you must apply to your entry for it to be counted and be sure that the tag is locked. You will also need to ensure that you do not apply any license terms to your entry for it to be counted. Please refer to the image below if you are unsure. Entries should appear like the image on the right, without any license terms set. Please be sure to follow the rules and submission guidelines carefully and stay tuned to VNN for further updates on this exciting contest. Previous Quadimension’s “亚特兰蒂斯Atlantis” Album preview and MEDIUM⁵’s Fifth Member Appeared! Next CangQiong’s First Demo Song Released!